Rufus Porter(1792-1884) was a many faceted man of many talents. He was a musician, sign painter, writer, dance master and the publisher of the Scientific American. He was born in West Boxford, Massachusetts in 1792 but moved with his family to Maine in 1804 when still a boy. He entered Fryeburg Academy but remained there only six months, ending his formal education at the age of twelve. He lived in Portland, earning his living first as a musician and then as a house and sign painter. His miniature portraits were the embodiment of his painting techniques and are clearly recognizable as "his" though rarely signed. They were side views painted in full colors. He used a stippled modeling technique on the sitter s face, aware of the many pitfalls to be avoided because of his extensive painting experience. By 1845 he had given up painting for his new career in science and invention. 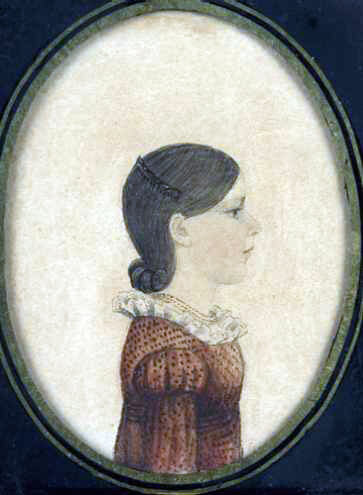 Writing on the painting of miniature portraits in the Scientific American in 1846, of which he was editor and publisher, he cautions: "In finishing the face and hair, the light parts must be preserved, for white paint must not be used except to produce some small specs representing the reflection of light from the eyes or from jewellery [sic]." Watercolor and pencil on paper. 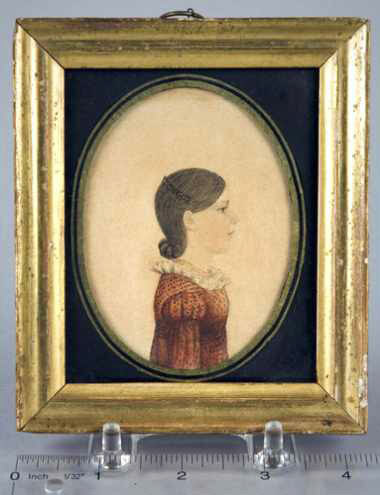 Sitter identified on the back as Harriet Mansus and dated 1825. In period giltwood frame with eglomise glass. Condition is very fine.